How can a year pass by so quickly, I wonder? It seems like I was writing a review of 2015 just a short while ago in the same place and at the same time in December of last year…while visiting my daughter in snowy Ottawa for New Year’s. However, early yesterday I woke up with thoughts of all that has happened in my life and the world over the past 12 months and, of course, wondering how 2017 would unfold for us all? Then I began to reflect on the places I have been and the posts I have written. Usually WordPress http://wordpress.com sends me a year-end review of the posts I’ve published but this year there has been nothing. With the last day of the year facing me, I decided to ‘take the bull by the horns’ and put something together myself. One huge benefit to the time and effort that goes into my writing is the final result. Now as 2016 fades into the distance, I can review what I wrote and reflect on many of the exciting but also downright difficult times throughout this past year for myself and the world. 2016 has never been dull and will probably go down as one of extremes and not one to forget. Depending on how you look at it, you might either say it’s been an exciting year filled with tremendous possibilities or a frightening year with the potential for disaster. It’s up to us to decide in what direction to choose. When I take a peek at my blog stats one of the first things I look at is which of my posts garnered the most interest. This year it was the interview I had with Peter Robertson in Buenos Aires which took top spot with 57 views… An Interview With Peter Robertson (click on the title to read). Second place went to The Cloud Forest in the Rainy Season (click here). This was surprising! I wonder if it was the pictures of the chocolate factory I visited in Ecuador which caught my readers’ interests? Then there were those posts which elicited the most comments: the ones that described a funny or harrowing incident, such as Oh, My Aching Feet (click here) relating the near miss of my flight to Buenos Aires, Mendoza – Touring the Wineries and the Andes (click here)with a description of my nail-biting trek into the Andes, or Our Trip to Tigre – Facing the Unexpected (click here) with the tale of our ‘mate’ tea scam. 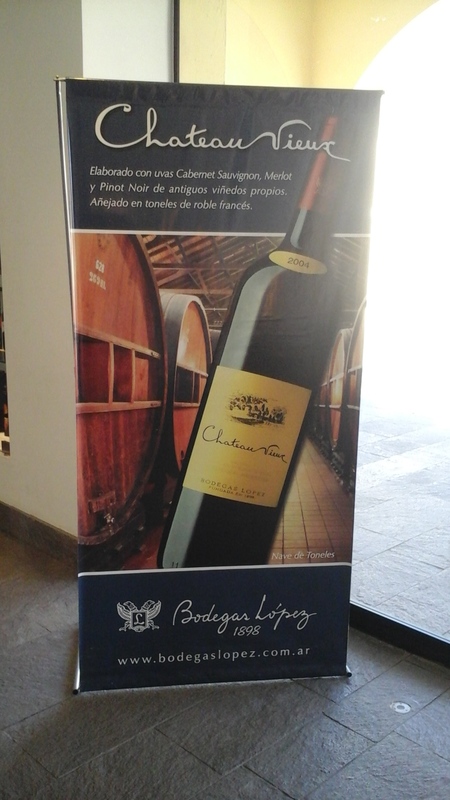 I suspect our visits to the wineries in Mendoza perked the interest of my readers, too. Another interesting bit of information Word Press gives me is from where in the world these views and comments are coming. It’s no surprise that Canada tops my list by far, with the United States a distant second. Thailand is third, followed by such European countries as Italy, Germany and France in top spot there. 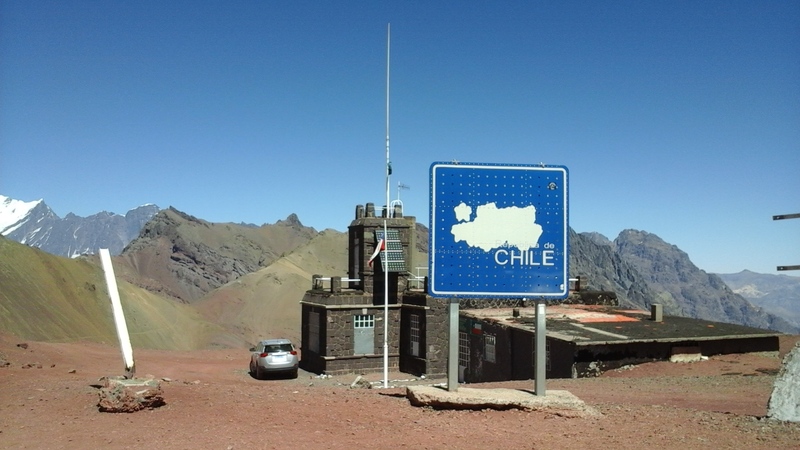 South America and various places in Eurasia…places I have been and written about… are appearing as well. Looking back on this past year, I am happy that I chose to break my pattern of going east to Thailand and instead heading south to that huge continent of South America. Ecuador and Argentina were the only countries I travelled to so there is still much more to see, such as Columbia and Peru. Those will be for another year. For the coming year, I have opted to once more visit Thailand followed by another visit to Viet Nam. As many of you know, I buy accessories such as clothing, bags, and jewellery to sell at our market in Annapolis Royal. Thailand is still my best country to shop just for the sheer number of markets I find there. In the past, Viet Nam has also been a good shopping venue so now I am looking forward to unearthing new treasures there. Great food and the openness and energy of the Viet Namese are other reasons for returning. As this year draws to a close, I can’t help feeling blessed that I am able to travel to the places I’ve been and hope to go in the future. The benefits I receive from my travels are invaluable… self growth, an escape from our cold winters, and making new friends are just some of them. I have not tired of this life style. Each year as the time nears to take off once again, I can feel the adrenaline beginning to flow and am filled with anticipation for what is ahead. In addition, I am thankful for my small family here in Ottawa who support my travelling lifestyle and a husband who freely lets me follow my life journey while he follows his. I also want to thank all my readers who so faithfully read my posts. Your encouraging comments never fail to inspire me to keep up the task of putting down in writing all that I have learned about the world as I continue to explore it. A Happy New Year to you all. My wish for 2017 is that all of us will continue to move forward in whatever way we can to make our world a more positive and peaceful place. 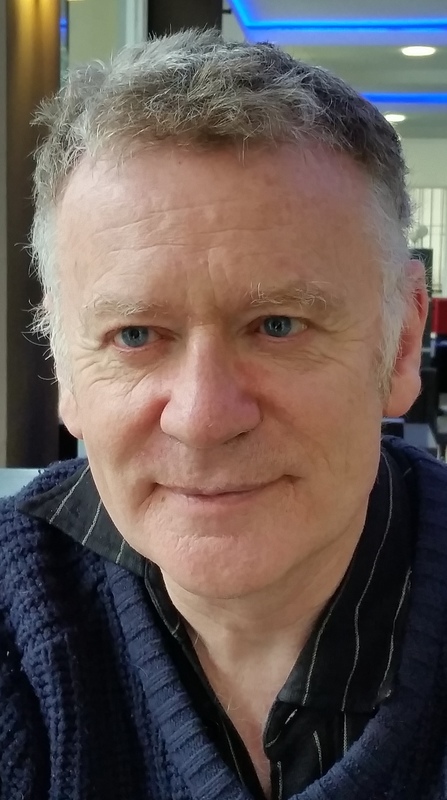 Peter Robinson – Founder and Editor of Interlitq. Over 9,000 ft. above sea level from volcano over looking Quito. Indigenous woman at Otavalo market. One of my vendors at the market. Country scene taken from bus. The Equator – centre of the world near Quito. The presidential palace or Pink House where Eva Peron made her famous speech to rally the workers. 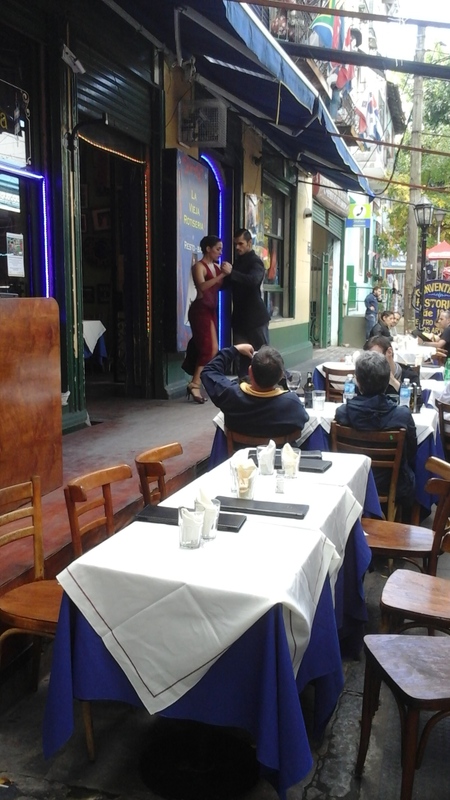 Tango in the plaza at San Telmo. The world famous Teatro Colon. One of the tallest buildings in South America. 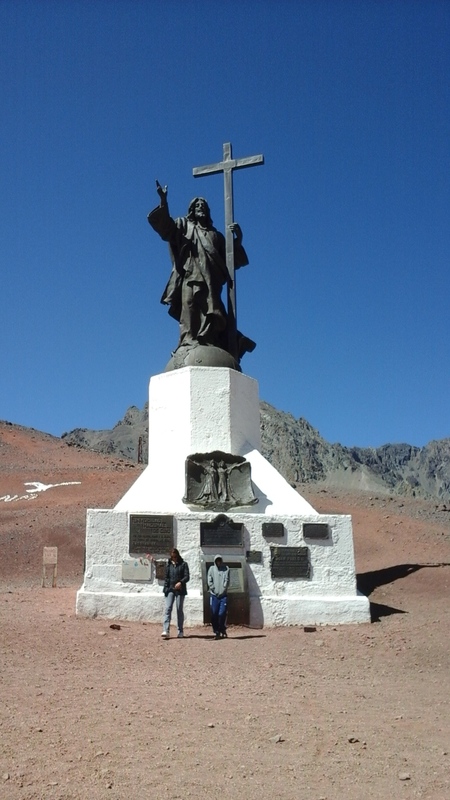 At the top of the Andes near the Chilean border. An Indigenous musician in Cuenca. A tango in the park. Xavier putting on the finishing touches. Gee and Melissa pouring the bubbly. Xavier and cousins taking in the New Year’s fireworks. Heaving a sigh of relief that we were finally settled aboard our ferry to Colonia del Sacramento, I was surprised to pick up on a familiar scent. Was that the ocean I smelled…but hold on…what ocean? It suddenly occurred to me that the ferry from Buenos Aires (BA) which was taking Hubby and me across the bay of the Rio de la Plata to Colonia del Sacramento in Uruguay was crossing a huge expanse of water that empties directly into the Atlantic Ocean. Looks are deceiving when you are confined to a large metropolis like BA. You really are totally unaware of any ocean nearby. Their harbour front looks more like a river. I must confess the ocean smell brought on a wee bit of homesickness. After all, I had not been anywhere near an ocean since leaving my Nova Scotian home almost four months ago. 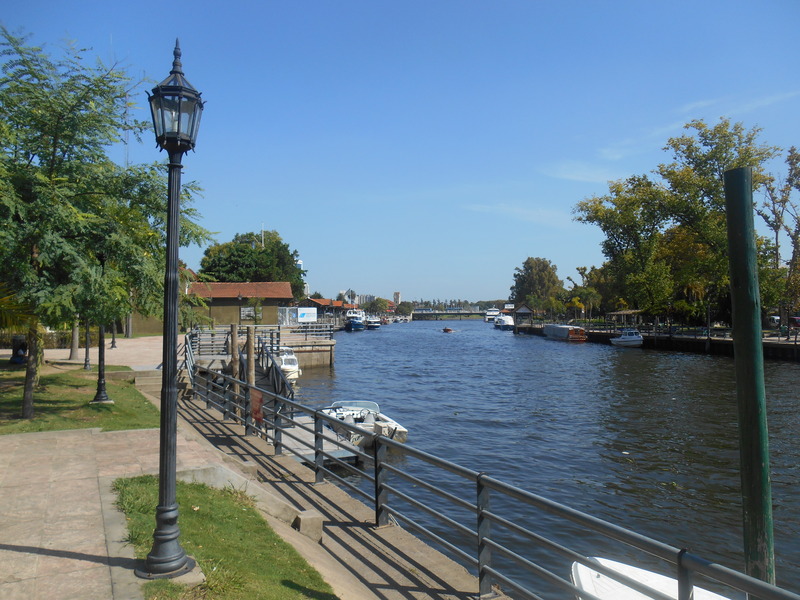 It was our last week in Buenos Aires in April this past winter that Hubby and I decided to take a quick trip over to Uruguay, the tiny country to the northeast of Argentina. 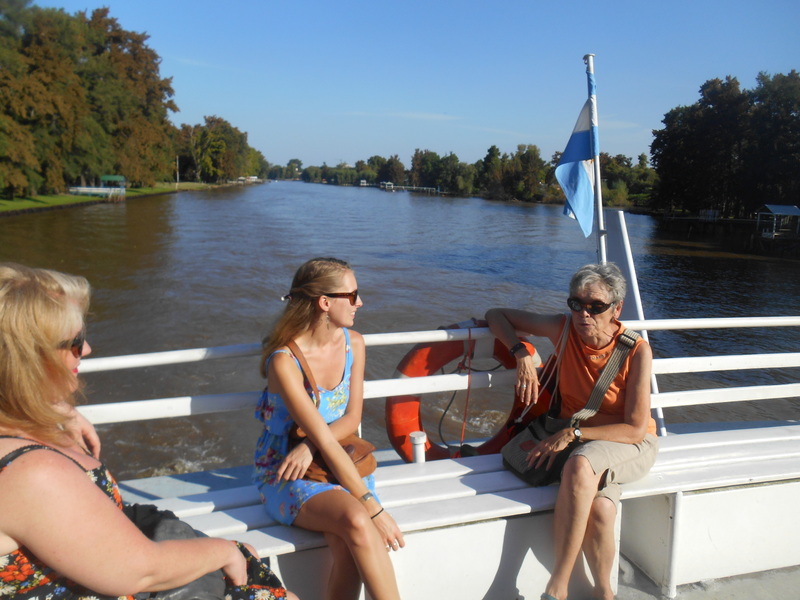 It’s an easy trip from BA over to Colonia del Sacramento, Uruguay’s second largest city after Montevideo, its capital. No visa is required and Uruguay’s peso is almost par to the Argentinian peso. Either one is accepted so we used our Argentinian pesos to avoid the hassle of changing any money. Travelling there is easy with two separate ferry companies vying for passengers : the Bourque Bus and the Colonia Express. 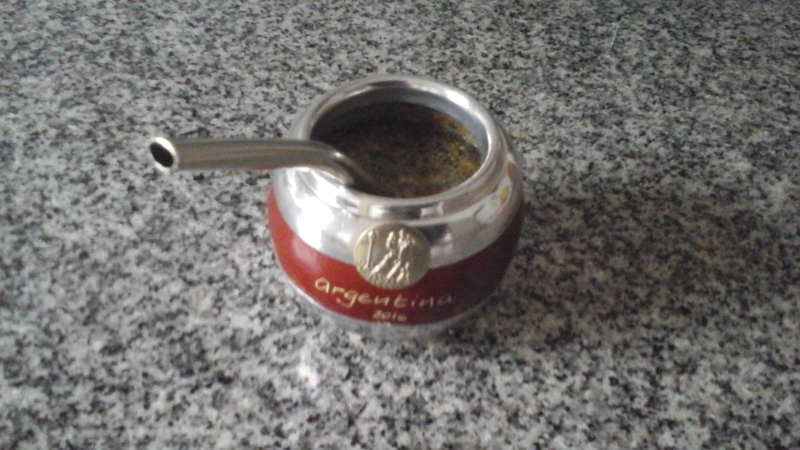 We took the latter since it was a bit cheaper and used more by the Argentinians. Bourque seemed to cater more to the tourists who want to visit for the day only and get there fast…in about an hour! This option can be more expensive but not necessarily any better. Our crossing took three hours which was fine with us since we weren’t in a great hurry. 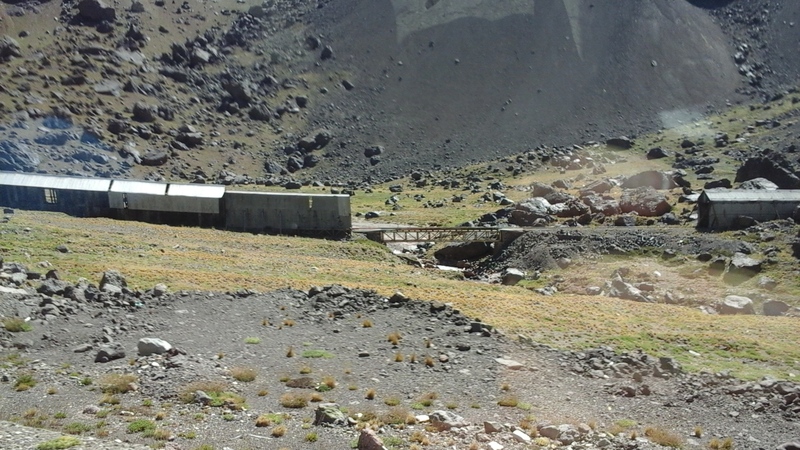 We were planning to spend the night there and return the next day. By the time our ferry reached our destination, the fog, which had delayed our crossing by more than an hour, had lifted, allowing the sun to burst forth and present us with a brilliant autumn day. Colonia del Sacramento has a population of roughly 27,000 and is a UNESCO World Heritage site. With its cobblestone streets lined with stately sycamore trees, it’s a fantastic city for walking just about everywhere. 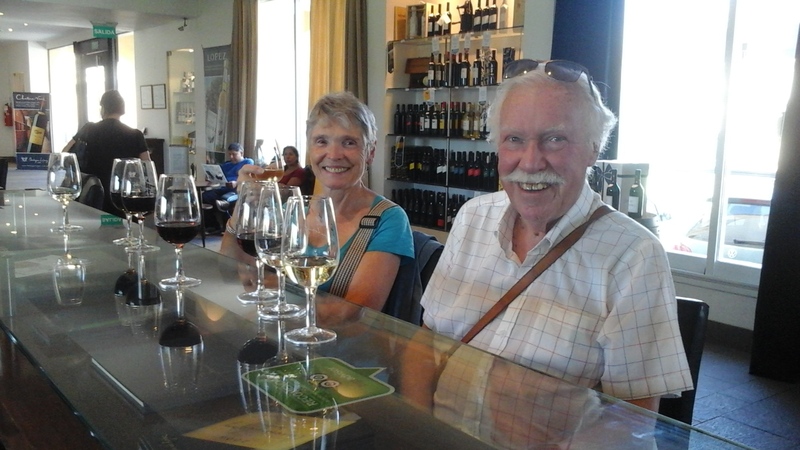 We found our small, family owned hotel – the Los Pinos – with an easy 15 minute walk from the ferry terminal. The centre of the city showcasing museums, restaurants, shops, and the harbour were another easy 15 minute walk from there so a taxi was not needed. Colonia del Sacramento is one of South America’s most authentic Spanish/Portuguese settlements founded in 1680 by the Portuguese. It passed back and forth in a tug-of-war between Portugal and Spain until 1809 when Uruguay finally achieved its independence from Spain. Over the years it has managed to preserve its heritage so that today you can see some remains of the wall and fortress that once protected it from invaders. Many of the buildings dating back to that time have been lovingly maintained or restored. As soon as we got settled into our hotel, we went in search of a cafe hoping to find one with good coffee. As we turned the corner from our street onto the main street…Av General Flores… lo and behold, there was before us a few small tables placed carefully on the sidewalk. And, there to our left was what looked like a coffee shop! This looked good and so did those mouth-watering cupcakes! The chap running the whole show turned out to be the owner who spoke excellent English and ended up serving us one of the best lattes yet. It was still too early in the day for one of those cupcakes; however, we did go back the following day for that indulgence and didn’t regret it. Colonia Sandwich and Coffee Cafe is owned and run by a young couple from Uruguay who learned the art of good coffee-making while living in Italy. After our coffee fix, we were now ready to explore the Cuidad Vieja or old city. The best place to begin a tour in any South American city or town is the main square or Plato Mayo. There is always at least one church to admire, if not on the inside, then at least from the outside. My favourite pastime is to spend some time sitting in a park people watching. However with so much more of the city to see, we were compelled to finally tear ourselves away from the park and an interesting conversation with a friendly fellow who had just moved to Uruguay from Toronto. We continued on and soon found ourselves at the harbour. Before us lay a lovely nautical setting which for me was another reminder of Nova Scotia. We walked along the pier to the lighthouse at the end admiring the display of vessels in all shapes and sizes. This could easily have been Chester, our famous resort town in Nova Scotia. The seaside restaurants looked so inviting that we decided to take another break and treat ourselves to a Campari special accompanied by delicious croquettes at a restaurant with an outdoor deck. Yes, somewhat decadent for that time of day, but the drink and the warmth of the sun pouring down upon us… remember we were in autumn and hadn’t seen much of the sun for two weeks…gave us another memorable experience to store away from this visit. Sufficiently fortified with food and drink, we once more set out for the Cuidad Vieja…but not before first checking out another lighthouse in the midst of the ruins of the San Francisco Convent built in 1694. A small entrance fee allowed me to climb to the top of the lighthouse where I got a fantastic view of the harbour and the entire city. Since Hubby doesn’t do well with heights, he decided to wait out this adventure. An hour or so later, we finally arrived at the City Gate and the entrance to the Cuidad Vieja. Although the Gate and the wall surrounding the old city were probably first built some time in the late 1600’s to keep marauding invaders at bay, much of it was rebuilt in 1968. By the time we had wandered down the ‘Street of Sighs’, one of the original cobblestone streets constructed by the Portuguese which has the drain running down the middle of it, we noticed that the sun had disappeared and dark clouds were already beginning to take over. Unfortunately, the threat of the rain which quickly morphed into a down pour soon put an end to our site seeing for the day. The next morning it was still raining heavily putting a bit of a damper…no pun intended… on what we could do. After a substantial breakfast at our hotel and another delicious coffee at the Sandwich and Coffee Cafe we decided to seek out the only option we had …. to spend our remaining time in the museums. Colonia del Sacramento boasts of having at least eight of them but because of the rain we could find only two open for business. One was the Municipal Museum so we sought refuge there. This one portrayed the history of the city as well as a good commentary on the culture and social customs of the 18th century. Running between the showers, we found the Portuguese Museum was open, too, so sought further shelter there along with some other tourists doing the same as us. 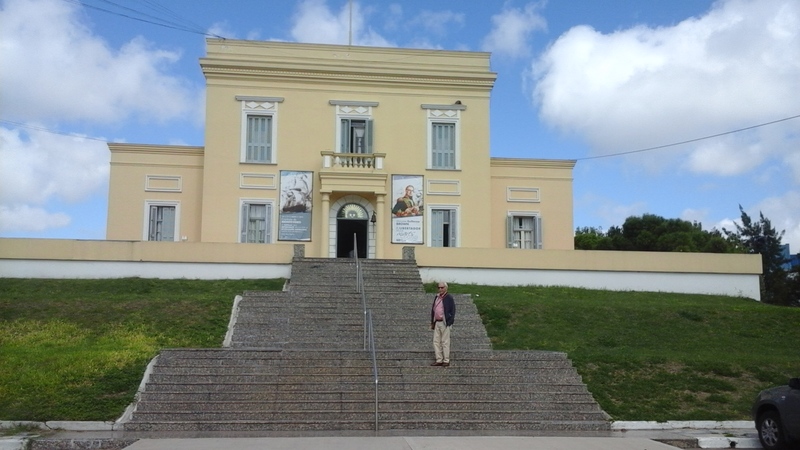 Here we found a home from the same time period which reflected how the first Portuguese settlers lived their daily lives. I was struck by the similarity of their life to that of our Acadians…simple but functional. Since our ferry wasn’t leaving until later that afternoon, our only option to keep us from getting a thorough soaking was to find a good eating place. Our hostess at Los Pinos had highly recommended Jon Joaquin, a well established restaurant with the best Neapolitan pizza outside of Italy, but after a somewhat wet search, we arrived only to find it closed. Desperate to get out of the rain, we headed back to Av General Flores and decided to take our chances by eating at the busiest restaurant we could find. If it’s busy and full of locals it must be good … or so the reasoning goes and is usually true. We decided on one very close to our coffee place and our hotel. Hubby had his proverbial beef with beer which satisfied him, however, my choice was a mistake. Not understanding the menu or our waiter, I thought I was ordering a Uruguayan speciality. Perhaps this dish was special to Uruguayans, but I have to admit I wasn’t impressed with the foot long wiener I found on my plate. The oversized salad accompanying it looked good but the scarcity of dressing was disappointing. 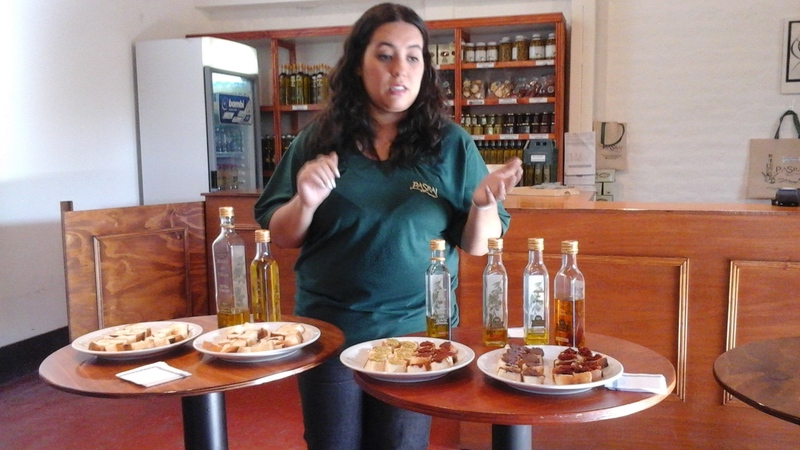 Apparently dressings, sauces and spices are often used sparingly, if at all, not only in Argentina but in Uruguay as well. 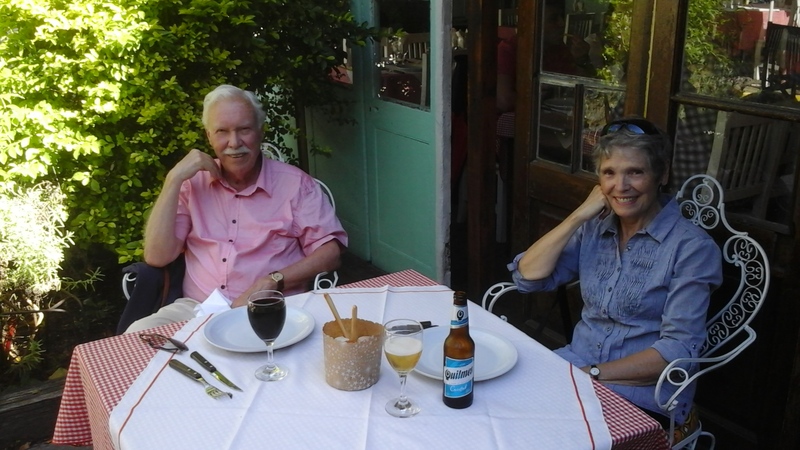 For anyone who decides to visit Colonia del Sacramento, there are probably many choices for good restaurant eating judging by the recommendations in Lonely Planet and Trip Advisor. One of them is the El Drugstore where we ate the night before. The food was good and wholesome, but what pleased us most about this place was the funky decor, the friendly service, and the entertainment. We were serenaded by a beautiful young woman with a fantastic voice and had the pleasure of her company during intermission. She once lived in London where she starred in musicals and built up quite a reputation for herself until she was lured back to her family and country. This seems to be a pattern for Uruguayans as well as Argentinians… to work and live abroad in Europe only to eventually return home to use what they have learned for benefit to their own country. If you were to ask me if our trip to Uruguay was worth it, I would have to say ‘yes’. Although a small country not much different in culture and history from its big neighbour to the south, it is still somehow different. I think it was the people we met in the short time we were there who were a little more open and willing to talk. They also appeared to be happier … but then who wouldn’t be in such a desirable city …with its history, culture, and location by the sea. It has much to boast about and those we met seemed more than willing to share positive thoughts on their country. If Colonia del Sacramento is a reflection of the rest of Uruguay, which I believe it is based on what I’ve read and heard, then it’s a wonderful example of how some South American countries are safe, politically stable, and experiencing a high standard of living. If you would like to learn more about Uruguay and its capital, Montevideo, you could check out http://traveleater.wordpress.com, a blog by Johanna Reid, who also visited Uruguay this past winter. To view the gallery of photos below, click on the first picture and go from there. 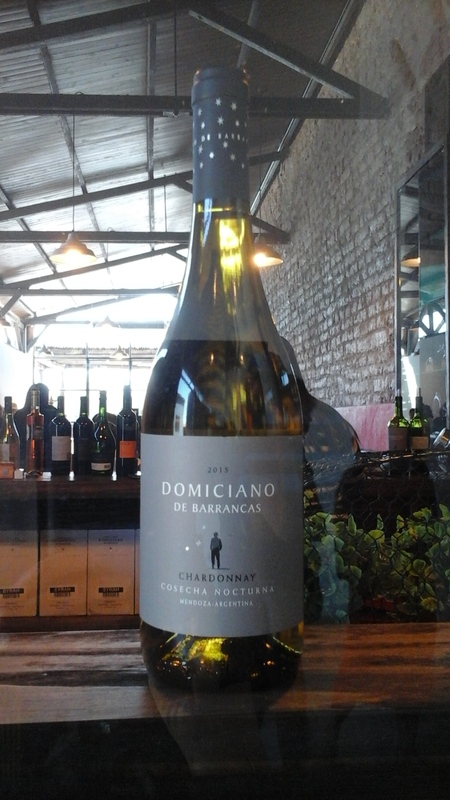 I hope these can help you enjoy Colonia del Sacramento as much as I did. 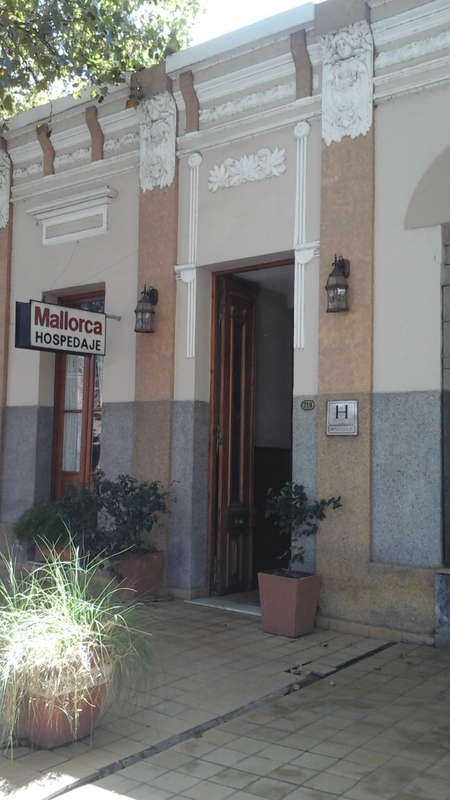 Arriving at the Los Pinos Hotel. Avenue General Flores near our hotel. The Colonia Sandwich & Coffee Cafe. Lighthouse in the ruins of the San Francisco Convent. View from the top of the lighthouse. Remnants of the old wall. Old cars are a common sight. Outside El Drugstore where we had dinner. This was a heartfelt plea from many Ecuadorians, locals and ex-pats alike, after the devastating earthquake that hit this beautiful country on April 16th of this year. I was fortunate enough to spend enough time there in January to develop a real liking for Ecuador and its generous people. Yes, our tendency may be to write off a country which has suffered such a blow, but it’s just when such a disaster like this happens that tourists need to keep on coming. Perhaps they won’t want to visit the western coast where the earthquake caused the most devastation, but there is still the central and eastern part of this tiny country which was still impacted both emotionally and economically rather than physically. Under the leadership of Raphael Correa for the past nine years, Ecuador has progressed from one of the poorest South American countries to one that has progressed to one of the most developed. As a result it has gained a reputation as a comfortable and affordable place to retire. Yes, this country now needs us to ‘keep on coming’ more than ever. One place that I visited this winter which was not affected by the earthquake due to of its southerly location in the central Andes is Vilcabamba. It has over the last 15 years or so become a magnet for not only tourists but also for adventurous if not disenchanted ex-pats looking for that proverbial ‘land of milk and honey’. It first grabbed the world’s attention back in 1955 thanks to an article that appeared in the National Geographic. They had heard the rumour that a more than usual number of its inhabitants were living to well into their 90’s so they decided to check out the rumour for themselves. Their article attracted a lot of attention but provided no conclusive observations. To this day, the answer is still up for debate on whether the story is based on myth or reality. 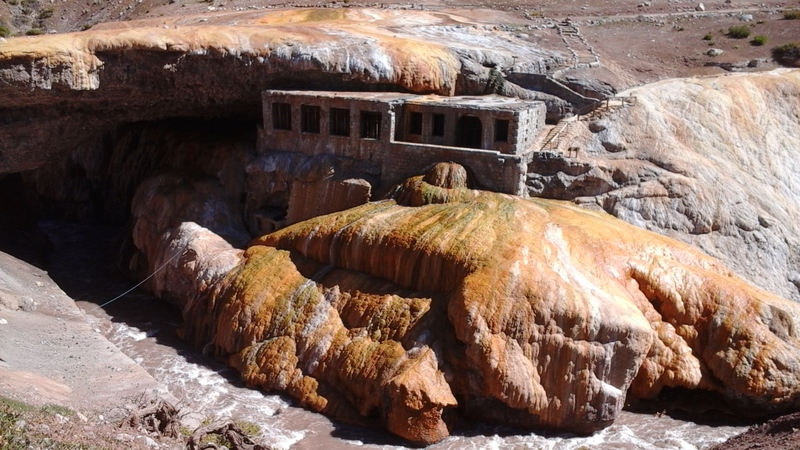 Over the years, it’s been called the Valley of Eternal Youth or Longevity and sometimes the Sacred Valley because the Inca claimed it as one of their most spiritual meeting places. I first heard about Vilcabamba in the International Living magazine which I have subscribed to off and on over the years. For five years straight, this organization has consistently given Ecuador the first prize as the best place for people to move to for retirement. It’s true, they often paint a picture of this country through rose-coloured glasses earning them the dubious title of “International Lying”, but nevertheless, they have succeeded in helping many people find a lifestyle which for the most part is fulfilling all the dreams they might have had. So, you may ask, is there really any evidence to support the claim for why this village has gained such a reputation as a haven for healthy living and longevity? There are many reasons as far as I am concerned, and the first that comes to mind is it’s almost perfect climate. From what I could gather by talking to those who live there and what I experienced, the climate is pretty steady and is almost ideal all year round. It’s not too hot and it’s not too cold. In a previous post “Ecuador – A Land of Diversity”, I wrote that in the northern Andes where the town of Otavalo is located, it can be quite cold, just as all along the low-lying coast it can be hot and humid. Vilcabamba also seems to get just the right amount of rain keeping everything green to allow for all manner of fruits and vegetables to be grown all year-long. You can expect grey skies, blue skies, sun, and maybe a light shower or two all in one day. This was the pattern while I was there and apparently this is what you get for most of the year. Boring you say. Well maybe for some but not for me; it’s what keeps their temperatures comfortable. Vilcabamba is located in the southern part of the Andes where the mountain chain begins to taper off, but it’s still over 3,000 ft. above sea level and, of course, near the equator which is another explanation for its almost perfect climate. When you live in a climate like this where you can grow fruit and veggies year round, chances are you will be eating a more healthy diet than you ever would in Canada or the US. Almost every fruit and vegetable imaginable can be grown there including coffee and cocoa beans providing two of our all time favourite foods – coffee and chocolate. Heavenly! Pesticides are not used here either. Could such healthy foods not be another good reason for the longevity myth? 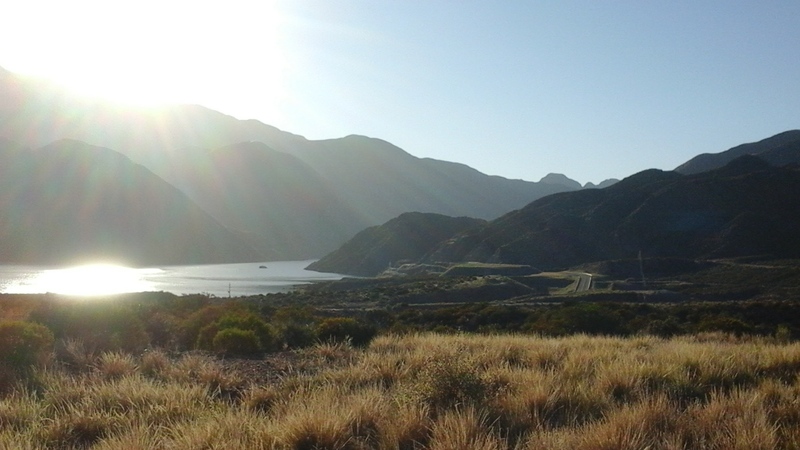 Vilcabamba’s environment is pretty decent, too. 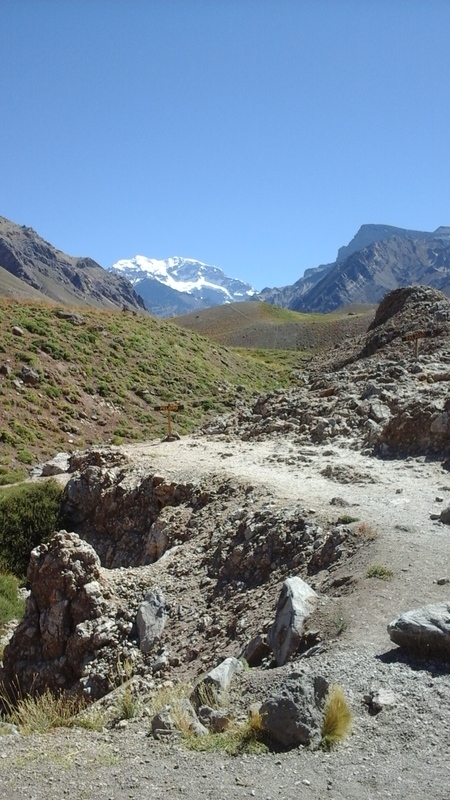 It has the Andes Mountains surrounding a spacious valley which in turn produces numerous rivers and waterfalls. There is no lack of uncontaminated water. In fact, much of it is used as a source of bottled water for parts of the country who want clean, healthy drinking water. This abundance of water also explains why fruit and vegetables grow so prolifically. Then there are the surrounding mountains with their imposing presence not only giving the village a pretty setting, but also providing many walking trails, hot springs, and spa resorts, another plus in support of health and longevity. Nature reserves and parks are abundant with at least three in the vicinity. I decided to take a morning hike to the Rumi Willco EcoLodge and Nature Reserve with trails to meet all levels of physical endurance including well-marked trees and plants for those of us who lack knowledge in botany. This reserve is situated in one of the most bio-diverse areas in the world with over 132 types of birds and 500 plant species. In fact, the Huilco tree from which the park derives its name is only found here and goes back to well before the time of the Inca as source of medicine for all kinds of ailments. So much green space in a high altitude would naturally suggest that the air is clean – another argument to support the longevity myth. Moreover, there is little industry here other than farming which seems to be all sustainable and organic, and the one water bottling plant I already mentioned. Nor are there any towns or cities within a 200 mile or more radius that have any kind of heavy industry to pollute the environment. For the time being at least. It seems that developers and farmers who want to burn their land to get in an extra crop or two are threatening to upset balance. The Rumi Wilco Reserve is one such project which was started by a private concern to be sustainable and to preserve what is in danger of disappearing. 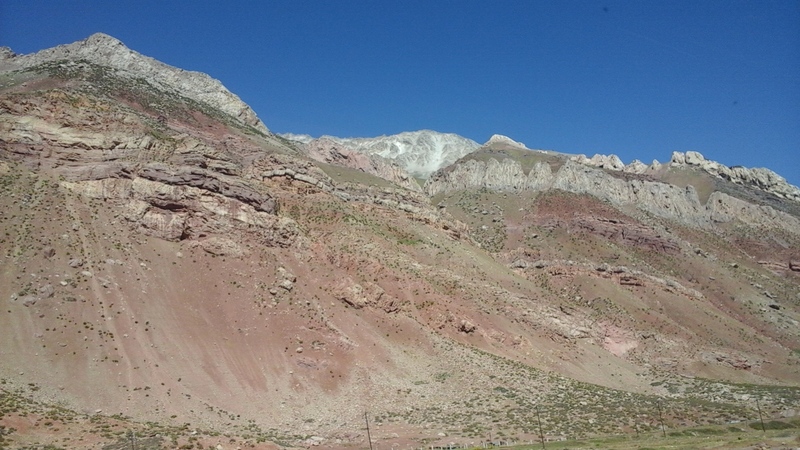 My final pitch as a possible reason for the longevity myth could be that so many of the herbs and medicinal plants that we have access to for good health are grown in this valley. Over 200 species of plants grow in this area and have been used by the indigenous people for centuries. The Wilco tree in the Nature Reserve is a good example. Would you be surprised to know that many North American companies are now looking at some of these plants as a potential cure for cancer? I have to admit I didn’t see any centarians while I was in Vilcabamba or even octogenarians for that matter. I was told, however, there were some around in the rural areas. Nevertheless, it makes good sense to me that if people are living in a warm climate with plenty of sunshine, growing and eating food that comes from clean soil, drinking clean water, breathing fresh air, and working hard at things that are meaningful to them, why wouldn’t they live a longer and healthier life? Do you still think that longevity in Vilcabamba is a myth? I enthusiastically recommend that people keep Ecuador in mind when planning their travel itinerary either now or for their next winter escape. I think you could easily fall in love with it as I did and the thousands of other ex-pats who now live there and make it their home. My bucket list does include another trip there in the not too distant future, and I definitely want to return to Vilcabamba. There are numerous places in this area where you can find that affordable haven for rejunvenation and well-being to suit all pocketbooks, great restaurants offering all organic food, delicious coffee, clean water and air all around. Let’s hope it can stay that way; a village that can still offer an almost perfect environment in a country which is still relatively safe and has worked so hard to promote its fledgling tourist industry. The Community Cultural Centre for yoga. 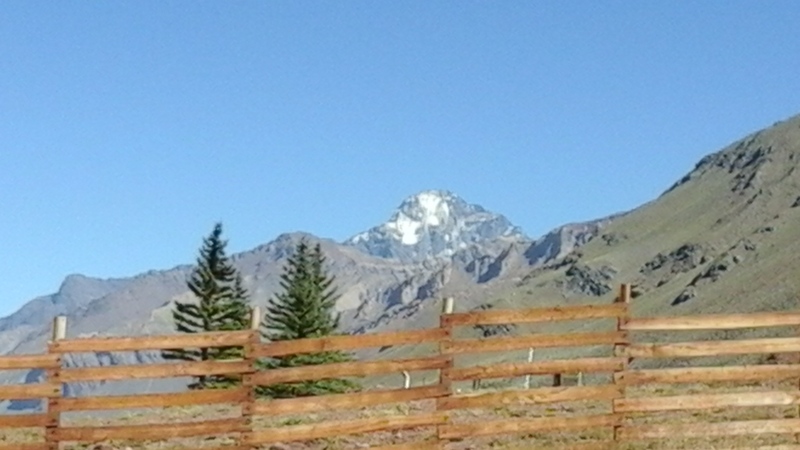 Entrance to the Village of Vilcabamba. Banana and coffee trees in our backyard. The other side of the square. The church dominating the square. On my way to Rumi Wilco Nature Reserve. Nature trail – 1st level. Not sure what this is good for. A closer look at the fig tree. One of the eco- cabins. Overlooking Vilcabamba from the reserve. Another river which runs through the bio-reserve. One of many healthy lunches. 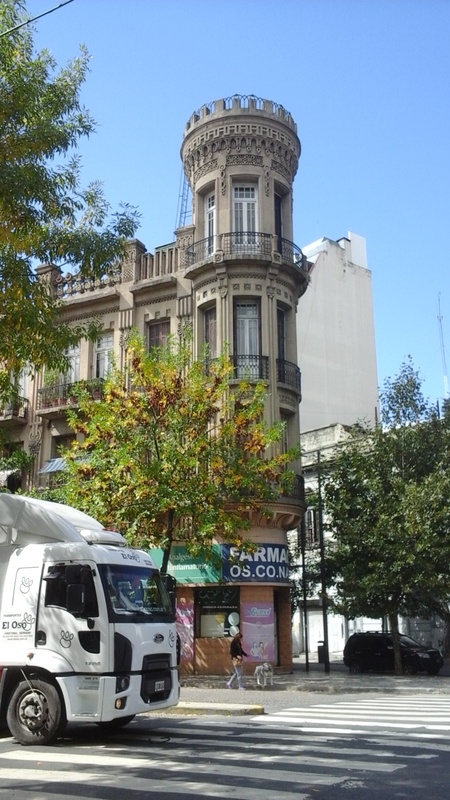 The famous El Caminito in La Boca Buenos Aires. If I had always taken the advice of others, chances are I would not be where I am today or done the things I have done. In my travels I have found the same thing to be true. 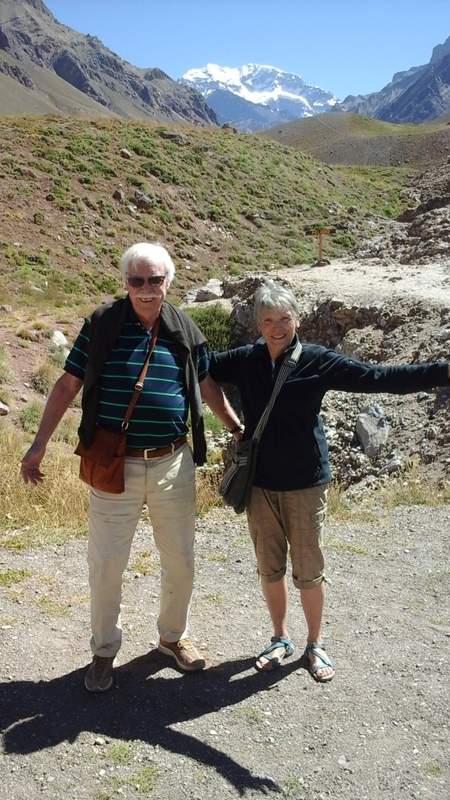 If I had always blindly heeded the advice dished out by travel guidebooks, newspapers, or governments, I probably wouldn’t have had the half the fun or learning that I have had. Experience has proven to me that the best way to decide what I should see and do when travelling is to read and listen with half a mind and then discover the rest for myself. 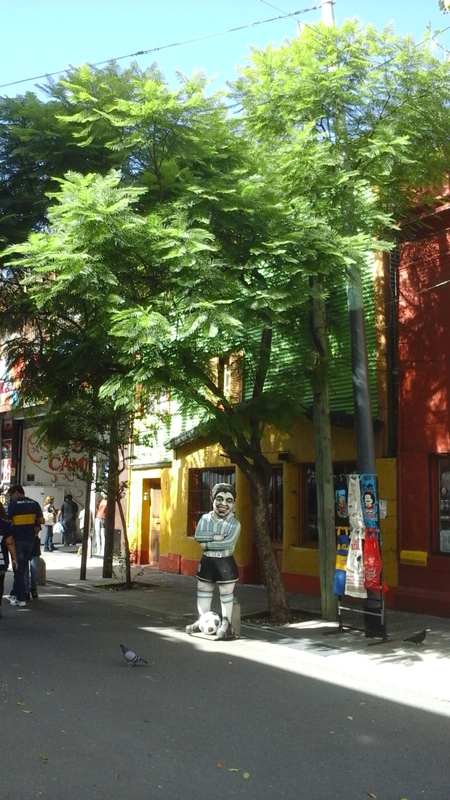 A day trip to La Boca, one of many areas or barrios in Buenos Aires, last week is a good example. Despite the warnings of it just being another tourist trap albeit an unsafe one at that, Hubby and I decided to go and see for ourselves. The obvious question for me was if it was so unsafe, how could it have become one of BA’s most popular places to visit? There had to be more than brightly painted houses to lure people there? 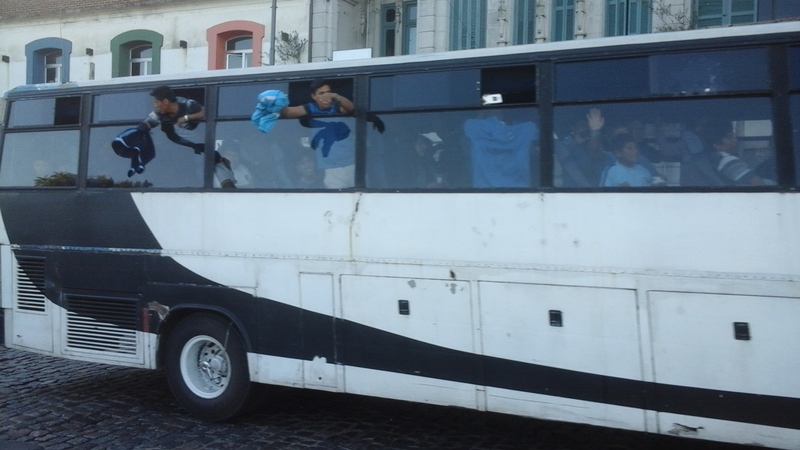 All the guidebooks and those we spoke to urged us to take a tour or at least a taxi but for heaven’s sake not a bus. We both agreed that an expensive tour and the taxi were out and the bus would be our means of getting there. So thanks to Wikipedia I was able to brush up on the history and to National Geographic for helping us with where to go once there. Finally, thanks to Hubby for figuring out how the bus system works and which bus or buses would take us there. At this point I should tell you a bit about the geography and history of La Boca before I take you on our self conducted tour. 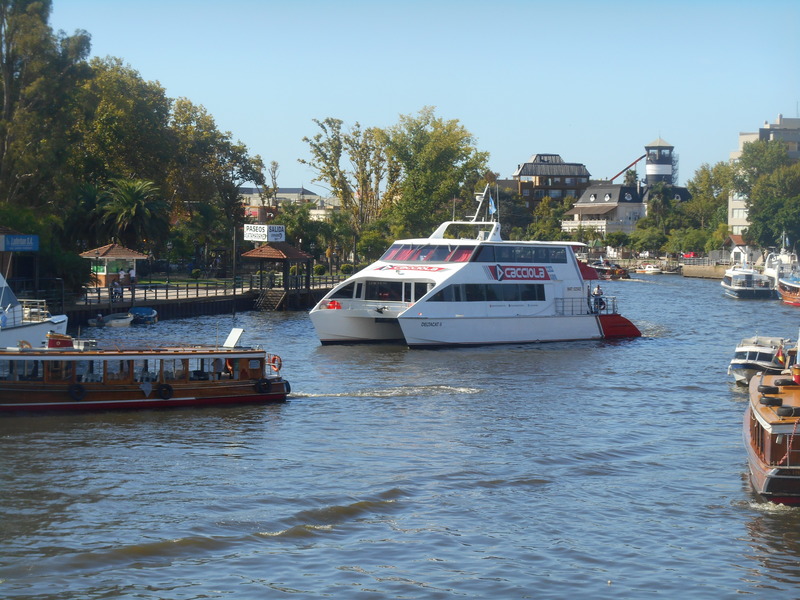 Geographically it lies on the low-lying shores of the greatly polluted Riachuelo River at the mouth of the Rio de la Plata, hence its name La Boca which is Spanish for ‘the mouth’. This location determined its destiny as an active port for importing and exporting which attracted mostly poor immigrants from Genoa, Italy. The painted houses for which it is famous were born out of poverty and necessity when the first inhabitants used scrap from the shipyards, such as sheet metal, blocks of wood, corrugated iron, and leftover paint to construct their modest houses. Over the years other poor immigrants from Europe, Africa, Arab, Peru, and Paraguay moved in to eke out a hardscrabble living. 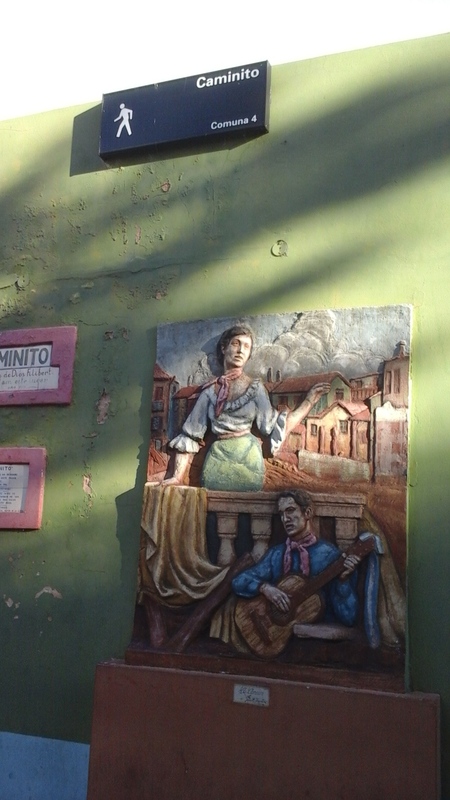 In the 1950’s a local artist, Benito Quinquela Martin, painted the walls of one of the abandoned streets and erected a stage. This street became the famous El Caminito or open-air museum. Thanks to Martin it became a haven for actors, dancers, and artists who have all contributed to its allure and made it what it is today: BA’s top tourist trap or attraction or however you want to look at it. It lures in hoards of tour buses which have spurred on a lucrative and much needed industry for the area. However, its success has also given rise to hoards of hawkers and hustlers who have contributed to its somewhat dubious reputation. Tourists are constantly warned to hang on to their pocketbooks, not to stray into any of the streets off the beaten track which is the caminito, or to stay after dark for a late dinner. We were also warned about the over-priced restaurants, gaudy knick knacks, and the bland food. After learning all this, why would it still lure so many visitors whether they be typical tour bus types or more independent adventurers like Hubby and me? Read on and you will find out. 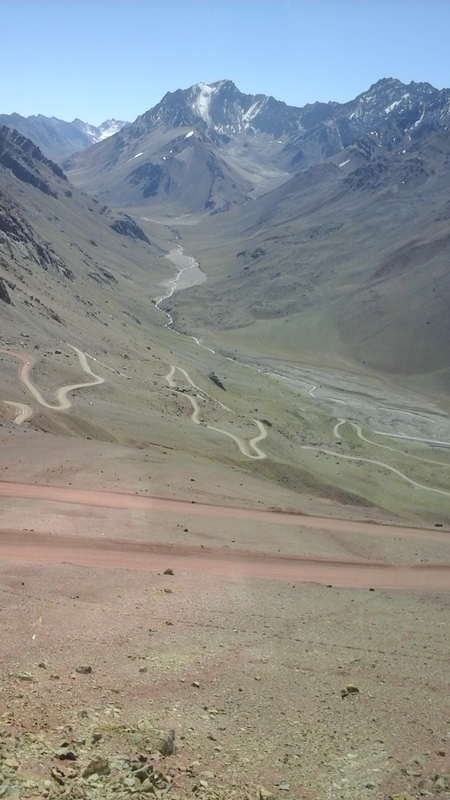 Getting to La Boca by bus wasn’t as difficult as I thought it would be. Hubby orchestrated this beautifully. He managed to get us there by taking only two different buses which he hauled off in his usual manner of enlisting as many poor bystanders as he could to help him out. Fortunately for him, the people in BA are more than willing to help their visitors find their way around. We started our walking tour at the north end of the Avenida Guillermo Brown. Our first stop was at the Casa Amarilla or “yellow house” which is a replica of the home that Guillermo Brown lived in. Brown was an Irishman who came to Argentina to help them fight for their freedom from Brazil and Uruguay. Our second stop was to take a picture of the Tower of the Ghost. The story goes that a female artist took her life by jumping from the top of the tower. Her spirit is said to still haunt the apartments there. Our third stop was for a coffee and small ham and cheese meurouzo (a small sweet croissant) to help us continue our walk to the Riachuelo River. 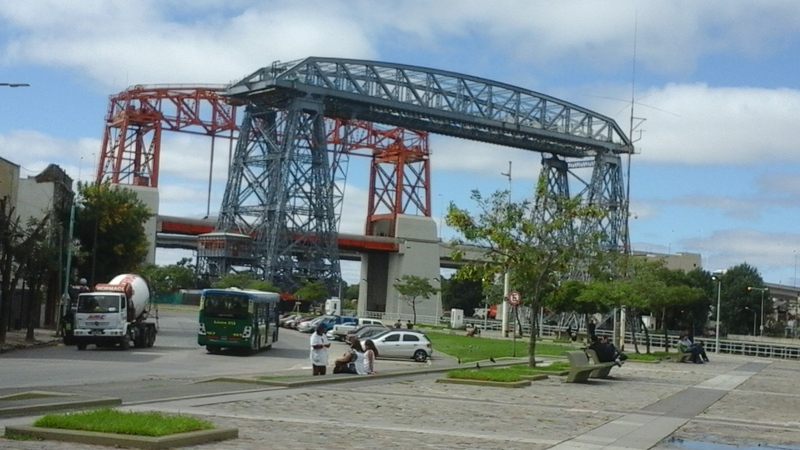 From there we got a good look at both the old and new Puente Transborado bridges and the famous stadium of the Boca Juniors soccer team. The stadium is old and ugly from the outside, but is still the place to see the most exciting soccer you will ever see and a chance to yell your lungs out whenever Argentina plays their main rivals. In La Boca they take their football very seriously. That’s another claim to their fame. By this time we had come to the caminito where we were confronted with a carnival like atmosphere of brightly coloured houses with lifelike charactures hanging from the balconies, a cobblestone street filled with vendors’ stalls, tables and chairs spilling from the restaurants blaring loud tango music and some demonstrations on how to tango, as well as every other gimmick available to get the tourists to empty their pocket books. Despite all this, I felt no pressure to buy as we walked along taking in some of the tango and shooting lots of pictures. Evidence of the Boca soccer team is everywhere. Spying a little alley way of shops with interesting merchandise, I pulled Hubby in. We landed in a tiny shop selling handcrafted jewellery and other unique accessories managed by a lovely lady, Annabella, who actually became our friend for the day. That is one of the curious traits of many of the Argentinians we have met: they love to talk and get quite personal about their lives if they speak English as she did. 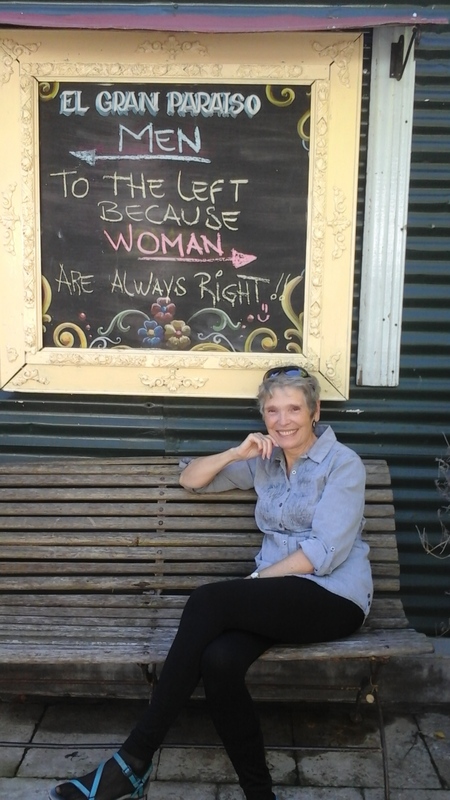 We learned so much from her including a great place to have a late lunch. She did not recommend any of the restaurants that we saw on the caminito but another one around the corner near the old railway track called El Gran Paraiso. We would never have found it on our own, but thanks to Annabella we ended up having one of the best meals we’ve had the whole time we have been in Argentina. 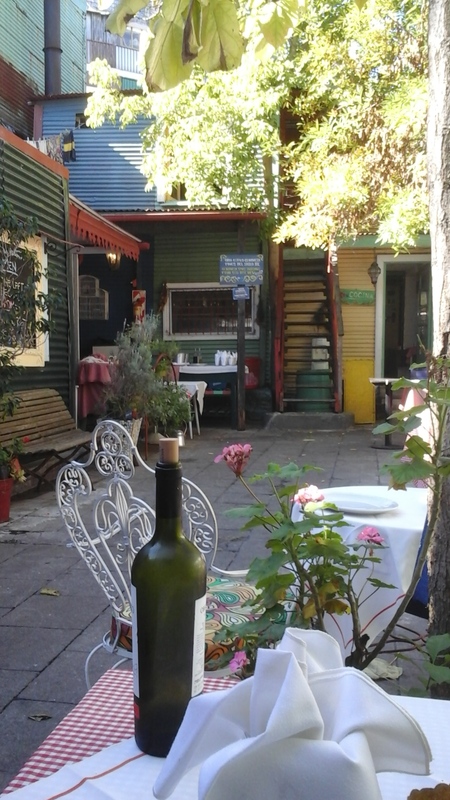 This restaurant is located in one of the oldest buildings in La Boca. A huge, rather ugly grille at the doorway doesn’t make for an inviting entrance. However, look past this and you will see tables with colourful umbrellas set in a beautiful garden with large shade trees surrounded by the colourful walls of the buildings. It wasn’t only the setting that made this place special, but also the food and the service. The prices were reasonable, too, which was another surprise since we have found them to be horrendously high in most places putting a damper on us ever eating out. 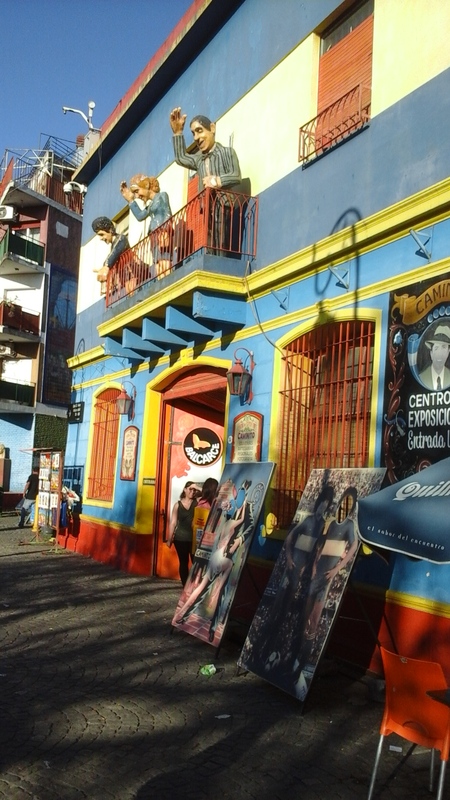 In fact, hadn’t we been told that we would find everything overpriced in La Boca? 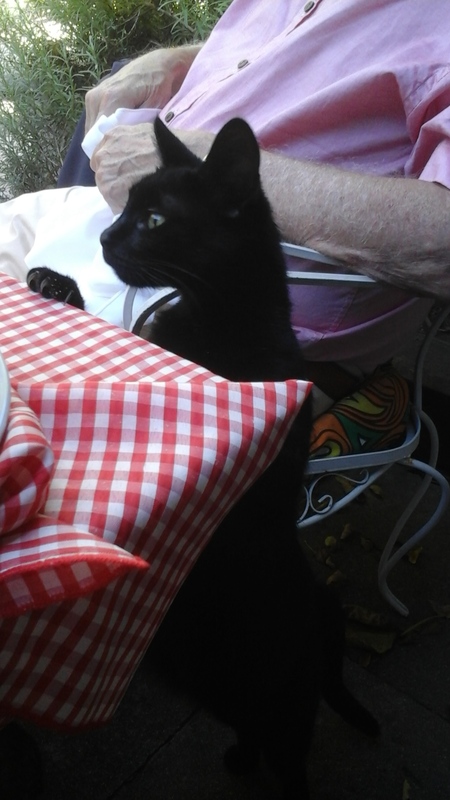 An unexpected guest joins us for lunch. We lingered much longer than we had anticipated over lunch. It was now 4 o’clock and in a few hours it would be dark. With the warnings of being there after dark ringing in our ears, we decided we better wend our way back to the port area where we could catch one of the numerous buses going in all directions. The biggest challenge here is making sure you get on the right bus so finding the proper number is important. This you can do by looking at the posts, studying the maps if there are any, or simply asking a fellow passenger as Hubby prefers to do. This seems to work for him so I’ve learned to let him figure it all out. 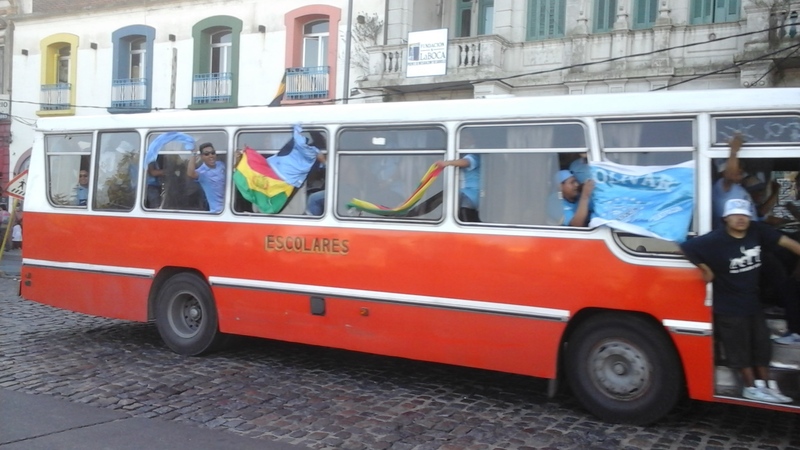 As we were waiting for our bus, we were bombarded with a constant barrage of blue/white and red/green buses all packed with people chanting and waving flags. It didn’t take us long to realize we were witnessing the foreplay which precedes an important game with the Boca Juniors and one of their rivals, in this case a team from Bolivia. Although exciting to see, it was also frustrating because it meant tying up the rest of the traffic and waiting for things to start moving again. This was too much time for my impatient Hubby who decided we should get off our bus and walk to another stop away from this soccer bedlam. After walking for about 20 minutes, I happened to catch a glimpse of a bus similar to the one we had deserted. Realizing it had to be the same one since the driver smiled in recognition, I took the chance of waving it down. Lo and behold he slowed up to let us back on with no additional charge. The ride back completed what I felt was another day filled with unexpected surprises. Fortunately, they were all good. Ironic that here of all places where we had received so many dire warnings about theft and over pricing we didn’t encounter any of these. We saw and experienced enough to recommend that it’s quite possible to get there on your own, to not spend a ton of money on food and fun, and to simply learn more about what this area is famous for. Amid the gaudy knick knacks and the somewhat seedy areas, the cultural history and sense of neighbourhood is still evident. We never once felt unsafe or pressured by pesky vendors. We did encounter this in Tigre where we least expected because it’s been touted as a very safe place for a family outing. You can read about Tigre in my last post. 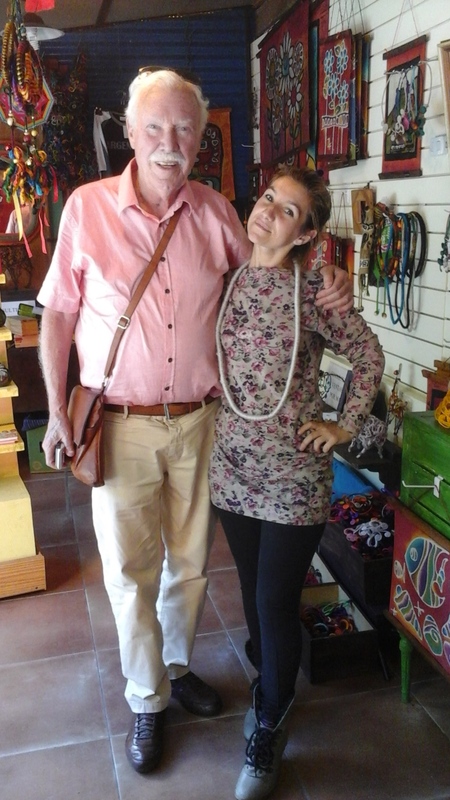 Instead in La Boca we met some really kind people like Annabelia and the waiter who served us our delicious lunch. I shudder to think that we might have missed this had we listened to all the nay sayers. 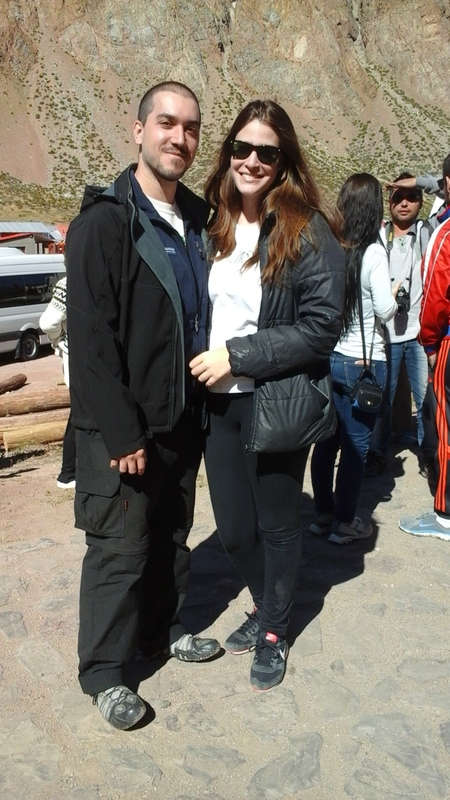 Ever since I have been in South America, I have been wrestling with how to deal with unexpected surprises. It seems like the last three months have been full of them most resulting from communication break down and in our case not being able to speak Spanish. A good example of this happened just this past week when Hubby and I visited Tigre, a suburb of Buenos Aires or BA as the ex-pats call it. Tigre is a suburb to the north of Buenos Aires on the Rio de la Plata and is a great place to visit if you are looking for an escape from the daily hubbub and noise of the city. The best way to reach it is to take a leisurely, hour-long train ride on the Le Mitre line from the Retiro train station in the city centre. It was a perfect autumn day, not too hot with clear skies and lots of sun. The ride didn’t provide much in the way of scenery except to reveal how those in this part of the BA suburbs live. The homes are more stately, high rises are fewer, and occasional glimpses of the Rio de la Plata were visible in the distance. The huge Rio de la Plata is the river or gulf (it is called both) which forms a boundary between Uruguay and Argentina and runs into the Atlantic. However, our journey was in no way boring since we did get serenaded by a quartet of singers who managed to grab our attention with traditional Spanish songs along with some modern-day rap. 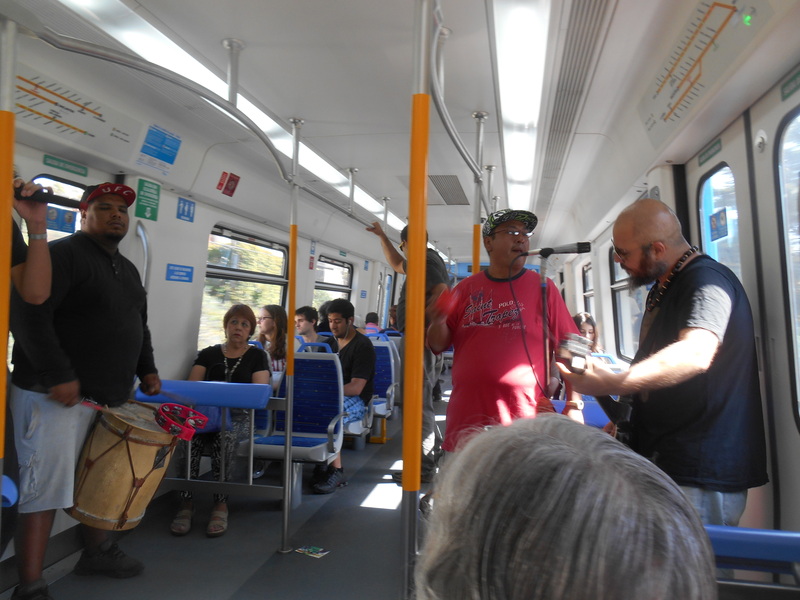 As we have found since we have been in BA, it’s common to be entertained by all kinds of talent on the trains and subways and to even do some shopping. At certain times of the day, when not too crowded, vendors selling everything from soup to nuts ply the cars and make surprisingly good sales. For the passengers it’s a convenient way to shop and pick up any little item they may need. The nice thing about this marketing scheme is that the vendors don’t pressure the passengers to buy. They run up and down the aisles chanting their spiels or even leaving a sample with each person which they will return to in a few minutes. You simply pass it back if you don’t want it or quickly hand over the money. It’s done effortlessly and with no hassle. Upon arriving in Tigre exactly one hour later, we quickly headed in the general direction of the Fruit Market and the area where the weekend market is held. Unfortunately, in the middle of the week there are only a handful of shops and restaurants open so the place was quite deserted. However, there are always some who stay open for those of us who venture out to avoid the weekend crowds. 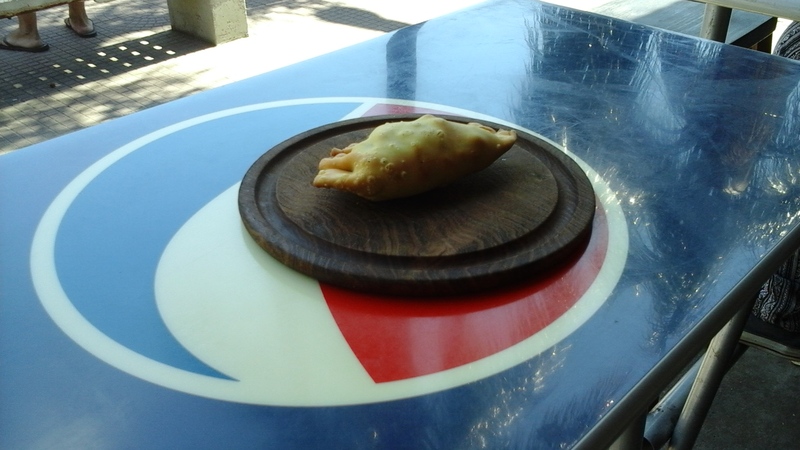 We quickly sought out a little restaurant right on the river which had empanadas (the South American version of our sandwich which is a meat, chicken, or vegetable filling wrapped in a kind of dough like pastry) which I had decided I wanted for my lunch. What a treat to eat our lunch near the water in the autumn sunlight. Yes, it’s autumn here in this part of the world and probably one of the best times to be here since the days are cooling down to a comfortable 25 degrees. They are also getting shorter which seems odd to us since we are thinking spring and feel they should be getting longer. 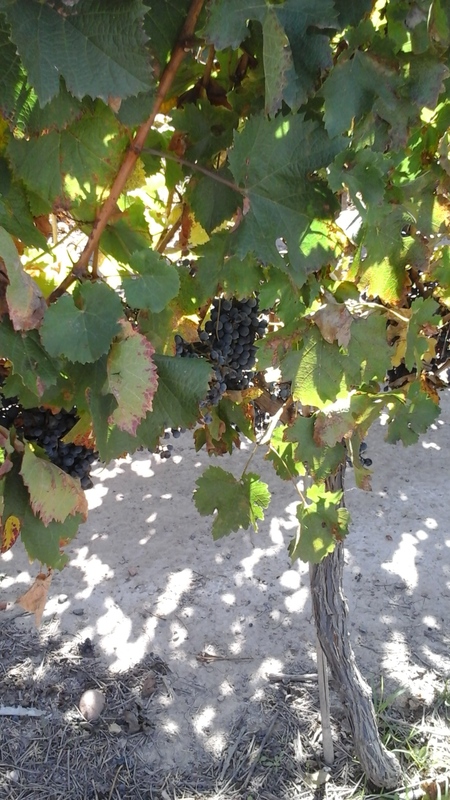 Oh well, the reversal of the seasons is just another little adjustment we have to deal with here in BA. After our leisurely, but unfortunately not too tasty lunch, we started out on an exploration of the stores that were open. On the way to the river front, we had spied an interesting looking panderia (bakery) with a huge array of Argentinian baked goodies so decided we would pick up a few items for next morning’s breakfast. Hubby saw they were advertising mate, an Argentine caffeine drink which they claim is better than green tea. Since President Obama had sampled the tea when he was visiting here last week, Hubby was curious as to what we had been missing so put in an order to the young chap behind the counter. He brought the tea in a special clay pot with a metal straw attached to the side, a large electric kettle, and a full bag of tea. I thought this was rather strange but didn’t say anything since there have been many things about Argentina customs we have found a bit strange, such as maps that appear to be upside down, too much salt in just about all the restaurant food, and far too many dogs. We both agreed that the mate was too bitter for our tastes even though it’s supposed to have many health properties and that would be the last time we ever ordered it. After drinking as much as we could so as not to offend our waiter, we asked for our bill. When he presented it to us, we nearly fell off our chairs. The grand total was 150 pesos which in Canadian dollars was $13.50! There had to be a mistake! We had heard about how popular the drink was and its wondrous health benefits but at this cost? Was it this magical? Perhaps if he threw in the whole bag along with the pot then this would justify the price. And if all the health benefits were true, then maybe we were getting our money’s worth? There was room here for some negotiation, or so I thought. Maybe he could lower his price to something more reasonable? The problem was how to communicate this to him when he said, “No Ingles” and we said, “No hablas Espanol”. He bombarded us by speaking rapidly in Spanish which he knew we didn’t understand pretending that he had no idea what we were talking about. Obviously we were at a stalemate. Should we give him something for his service and if so how much, or should we just walk away? Yes, this thought had actually occurred to us. However, being nice Canadians we couldn’t do this so very reluctantly gave in to his demand and paid the bill. We sat for a while at our side-walk table still in a state of shock. This incident had left a bad taste in our mouths. I could see that Hubby’s shock was rapidly turning into a fury at his conclusion that he had been taken. Meanwhile, I tried to drink some more mate to not only get our money’s worth but to try to get the effect of some of those health benefits. I was right, however, as Hubby went into action by first yelling at our culprit or hapless waiter (at this point I wasn’t sure what he was) and then enlisting the help of anyone near by. The first person he nabbed was an older woman who smiled and greeted us in French as she walked by our table. He related what had happened and asked her whether this was a fair price. She seemed aghast at what we had paid and intimated that it really shouldn’t have cost anything as it was more a service to visitors to acquaint them to the wonderful benefits of mate tea. Another young man appeared who spoke fairly good English who said the same thing, but it was obvious that neither of them wanted to get involved in this dispute as they gradually faded into the background. Not inclined to give up easily when it comes to money, Hubby again enlisted a group of about five more people who approached the scene. One of the group, a woman who spoke very good English and immediately understood what had happened to this couple of unsuspecting tourists, undertook the task of making Hubby’s wishes be known that all he wanted was half his money back or he would get the police involved. Oh dear, at this point I really began to wonder how this would unfold. Would this final ultimatum work? Against the wishes of her friends and possibly family, as we didn’t have a clue who these people were, she barged into the bakery to confront our culprit. Within seconds she came back not with half the money but all of it, handed it to Hubby, and told us to leave quickly. Surprised by this sudden turn of events, we thanked her profusely to which she immediately grabbed us both with a strong embrace planting many kisses on our cheeks before her friends grabbed her to lead her away. We were left shaking our heads in disbelief at what had just happened. We really didn’t know what to make of it all other than to surmise that the young scoundrel had tried to make a few extra bucks off some naive tourists who spoke no Spanish. On the other hand, we realized once again that as a tourist you always have to be vigilant in a country with a different culture. Argentina and Canada share many similarities in lifestyle and culture making it very comfortable so it’s easy to become complacent. Everyone we have met has bent over backwards to help us with directions, to translate to others when we are having difficulties, and to warn us about watching our personal belongings when in public places. On this particular day we simply weren’t prepared for this unexpected incident. There is also no doubt in my mind that if we had the language skills our outcome would have been less stressful. Our mate was not in this cup. I bought this as a souvenir and it’s made of metal. Thankfully the remainder of our day passed with no further surprises. To complete it before heading back to the city, we decided to take a relaxing boat trip up the Rio to see ‘some nature’ – the sales pitch used by the boat operators. A huge catamaran took us past the beautiful estates of the wealthy who have sought out Tigre as their place of escape from the big city. An extra bonus for us was to meet two delightful sisters from England whom we instantly connected with because we all were dying to have a good conversation in English. This is one of the most rewarding aspects of travel in a foreign country. Perhaps more so when we are beginning to feel the first pangs of travel fatigue and miss having our own language all around us. 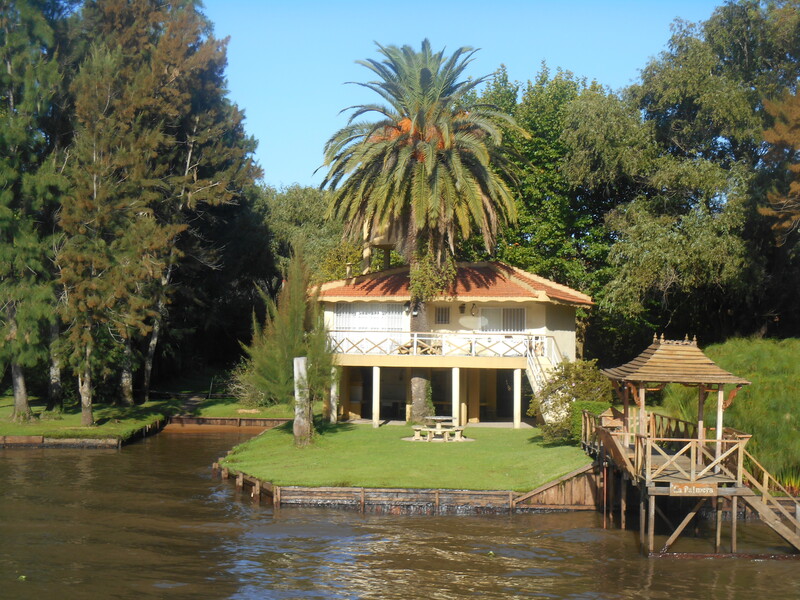 A home along the river as seen from our catamarand. Me with English sisters – Naomi on the left and Natasha in the middle. 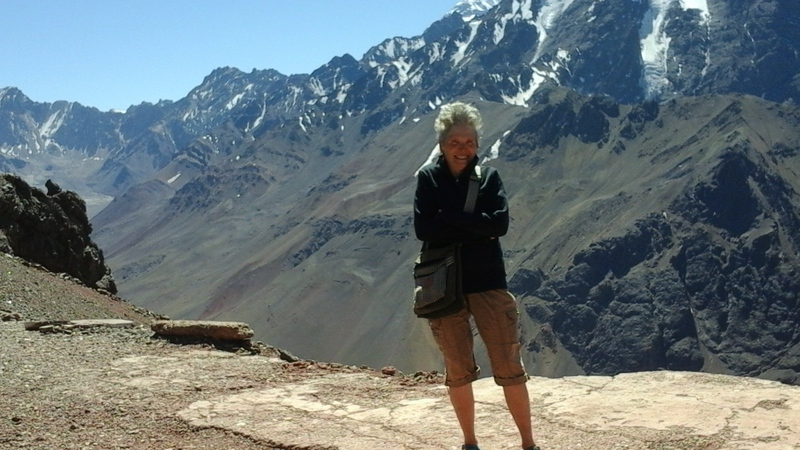 So again, as has happened so many times on this South American trip, challenges have arisen quickly and unexpectedly only to be followed by something positive and uplifting. This is the thing about travel. You never know what to expect. All we can say is that it certainly isn’t boring – not for a minute!